Signup Using Your Mobile Number . On The Next Screen You Will be Asked For Refer Code . Choose Products in Snapdeal App . Add Products to cart . Pay via Freecharge (Full Payment). Done, You Will Get 100% Cashback Upto Rs.200 Within 14 Days Of Delivery . 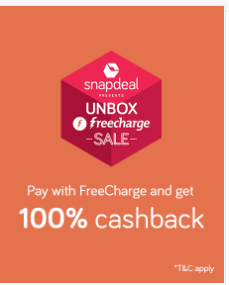 Get a maximum of Rs.200 cashback, valid only once per user on www.snapdeal.com, m.snapdeal.com and Snapdeal Mobile App.